Corset Wedding Dresses Create A Great Shape! Have you had your eye on one of those corset wedding dresses? They have been the rage for quite a few years now. Some brides are going to the trouble and expense of having the zipper taken out of their gown and replacing it with a lace up back.. Most trends stay for a few years and then they are gone. Why has this one held on so long? "Because brides really like the benefits of wearing one and they like what they see!" A corset wedding gown has one distinctive feature that is different from all other wedding dresses. 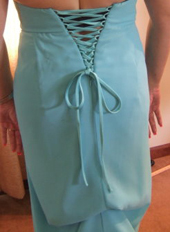 It's the lace up back closure gown. There are some medieval styles that have lacing details on the front, but that is mostly for decoration. Corset bridal gowns usually have lots of boning. In top designer wedding dresses, it is not uncommon to have 16 to 20 pieces of boning in the seams and in between them. This helps to keep shape to the gown. But best of all it also helps to shape you. In some cases brides find that they don't have to purchase an additional bra since the gown is built so well that it holds everything in place. This can save you a significant amount of money, since most strapless bras are selling between $50 to $100. A corset gown may or may not come with a modesty panel. Some bridal designers make this an optional panel to snap in or take out. Some are sewn in, but can be removed by a seamstress if you want your skin to show through the lacing. The lacing itself can be as narrow as a shoestring or 1 inch wide. The narrow lacing allows you to see more of the modesty panel or your skin underneath. Wide lacing covers more and it also allow you to pull the lacing tighter for maximum shaping. The lacing string laces through fabric loops or metal grommets. So which body shapes are helped the most with corset wedding dresses? Well most shapes work well with a corset lace up dress. But here are a few figure types that this style helps the most. When you lace the gown up you can feel your body taking on an hourglass figure. For this reason, this style wedding dress works great on a rectangle shape body. This means you have a little bit of a thick waist. But when the laces are pulled tight, you will like the way a corset wedding dress nips in your waist. Are you a bride looking for wedding dresses for a large bust? Give this style a try. Because the lacing holds you securely, you are uplifted and held in place. Just make sure your neckline is high enough to cover you sufficiently, if you are concerned about cleavage showing. If you consider yourself to be have an apple shape, meaning you are fuller in the waist than your bust and hips. The corset bridal gown style pared with a good strapless bra and/or shape wear will work wonders on your figure. For the pregnant bride, a lace up back gown is great because of the adjustability of the size for an expanding tummy. There is one more advantage in choosing a lace up corset back wedding gown. If you have fluctuations in your weight up or down, this style can adjustment to it easily. If you gain a little or have water retention problems this gown style is the perfect solution. These suggestions work mostly for losses of no more than a few pound. Now if you gain weight that translates into 1 size up, you can get away with that. You will just have to deal with your back penning being open more than you expected. An opening of 3 to 5 inches is normal. But a span of 6 to 7 inches is not uncommon. But if you lose more than a dress size you may find that you will need to have your wedding dress taken up in the sides to give the desired span width you need for your gown once it is laced up. 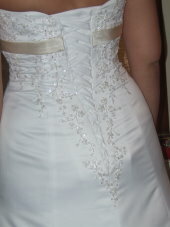 "In my business I have seen amazing results in the shaping ability of corset wedding dresses. So while you are shopping for your bridal gown, try one on and see if you agree! This may be your perfect wedding dress!" Do you need tips for dressing your rectangle or pear shape body? Read these helpful guidelines. Check out these tips for brides who need styles to compliment a prominent bust or and hourglass figure.